We all know that our world has changed dramatically in the past five years – with a massive increase in digital connection and a vast decrease in live or person-to-person communication. How has this shift affected our levels of true connection and what can we do to strengthen our bonds with the people we live and work with? Here to answer that question is Chad Littlefield, the co-founder of We and Me, Inc., an organization whose mission is to create conversations that matter. As an author and TEDx speaker, Chad is called on by leaders and organizations who want a dynamic expert speaker, mentor and facilitator to help create a culture of connection and effective communication. Kathy Caprino: Chad, it seems many of us we actually failing to connect in a meaningful way with others, despite our living in a hyper-connected world. Why is it so hard to connect in positive ways? Chad Littlefiled: Actually, we are trying to connect. We are starving to connect. On average, we spend about 10 hours per day “connected” through a screen. Sherry Turkle, researcher at MIT reminds us that the reality is that all these “sips” of online connection never actually add up to a “gulp” of human connection. There are three major reasons why we are failing to connect — meaningfully. This curiosity deficit prevents us from building trusting, healthy connections. With the sounding board of social media, it seems we speak more in declarative statements and less in questions. Questions are like keys that unlock the lifetime of un-Googleable experiences, differences, commonalities and connection points that we each carry in our minds. There is no backspace, no “undo send” and no ability to draft a communication and consider the ramifications for a couple hours. Face-to-face, live conversation introduces us to social and emotional risk. Our brains are wired to avoid social and emotional risk in the same way we used to avoid saber tooth tigers. Neuroscientists have even found that “social pain” and physical pain activate the same regions in the brain. It’s easier to avoid social pain than it is to take the chance of connection. Caprino: How can we shift from small “bytes” of connection to more meaningful connections? Littlefield: The first step is to take positive social risks. This is the simple act of stepping outside your comfort zone, wherever that might be, with the intention to create a genuine, human connection. After a while, we realize that our perceived social risk is almost always higher than the actual risk. A great starting point: follow your curiosity with people. This tool offers a socially safe way to access who somebody is because what we “wear, carry, or share” often reflects a personal choice of how we want to show up in the world. Often, not always, and this is where empathy comes into play. Lastly, remember that curiosity is a choice — not a fixed trait. Like a bicep or tricep, curiosity can grow stronger or weaker. The more we ask questions, the more natural it becomes. Great questions fuel our conversations. Our conversations form the foundation for connection. Don’t get me wrong, there is much more to meaningful connection than simple asking questions. Listening, time for reflection, empathy, silence, nonverbals, etc. A conversation without self-disclosure is an interrogation. But paying attention to our questions is a great place to get started. Caprino: What are three things leaders, managers and others can do to connect meaningfully and quickly with their teams? Littlefield: For the busy managers and leaders out there, here is a one-minute, five-minute and 15-minute exercise to build trust and connection on their teams. Be clear about your intention and share it. At the start of your next team meeting, one-to-one or off-site, share your intention with the group. As Wise discusses in his book, intention is the foundation for avoiding manipulation, which uproots trust and connection. Simply sharing an intention that includes the needs of the whole team serves as an invitation for everybody to play the same game. Got an extra minute or two? Have each team member create their own intention to share with the group. This is my all-time favorite exercise to do with a group of 12 or more people. Perfect for team retreats or to kickoff a standing meeting. I’ve facilitated this specific exercise with well over 25,000 people and I have never had it flop. Basically, you ask everyone to choose a question. We use a card deck that we developed but you can make your own out of 3×5 notecards. Then ask people to pair up with one other person to ask and answer the questions on their cards. Swap cards after each conversation and pair up with a new partner. It is a beautiful self-facilitating exercise that allows people to be in conversations as long or as little as they would like. Caprino: So how does something that some managers and leaders would call “fluffy” or “soft” like connection or trust impact a company’s bottom line? Littlefield: In order to make time for it, it must be set as a strategic priority. If leaders need some hard evidence to make this happen, below is some key data on the trust gap and the power of connection. On top of it all, trust and social connection is actually a key ingredient to building the “perfect team.” Google’s Project Aristotle uncovered that the number one indicator of a high-performing, innovative team is the degree of psychological safety in that team. This is the academic way of saying “interpersonal trust.” That trust and sense of safety develops largely through social and personal connections. These stats also align with eight decades of landmark research from the Harvard Study of Adult Development. The director of this ongoing study, Dr. Waldinger, says that “people who are more socially connected to family, friends, and community are happier, healthier and live longer than people who are less well connected.” Happy and healthy employees also tend to be loyal and productive employees. 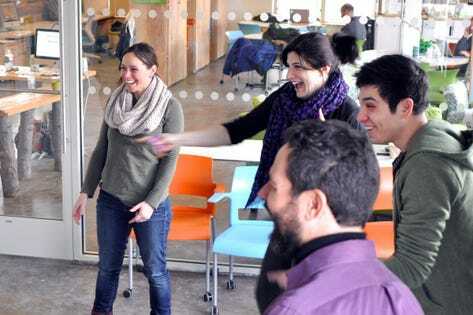 Caprino: What about the role of “small talk” – that type of conversation we all engage in every day with people around us or at work who we don’t feel close to, or even with those we do have a connection with. Does small talk hold any value? Littlefield: This is a funny question because I feel quite strongly that the reason I’m on this planet is actually to “gently eradicate small talk.” Key word: gently. Even though very few people love small talk, we still find ourselves chit-chatting about the who knows what with some frequency. The value of small talk is that it is safe. There is very little social or psychological risk in asking questions like, “What do you do?” or, “Where are you from?” At the same time, low risk often means low reward. On top of this, Psychological Science published a study on over 20,000 audio recordings which found that people who had more authentic, substantive conversations also tended to be happier. Caprino: So how can asking better questions get us to having more authentic, substantive conversations? Littlefield: There is a decade of research that says knowledge of personal backgrounds of others leads to shortcuts for effective communication. How can we access information about people’s personal backgrounds? By asking questions that sparks connection. And asking intentional, empathetic questions that are rooted in our natural, genuine curiosity. Now that has the power to transform differences into connections. The best way to break down communication barriers and increase connection, engagement, and trust on your teams is this: Start speaking less in periods and more in question marks. To learn more, visit www.weand.me/ideas and We! Connect Cards.